So here we go. This is just a V1 of the thread, so I'll try to keep it updated with any changes. Be forewarned, I did try to use spoilers to shrink down some of the text, but it didn't seem to want to work. "Could this rain be never-ending, or has time been washed away?" 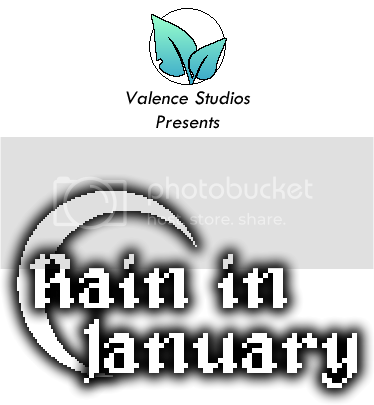 Rain in January is my solo project of many years. I started it in 2010, and have since lost and rediscovered it countless times. While I've had many projects before, this is the only one that I feel I stand a chance of completing with minimal staff and expenditure. I hope you guys like what you see, and hopefully before long I'll have a demo out of this, career permitting. It was many years ago that a legend began to spread through the land. It spoke of a vast, prosperous kingdom, ruled by an almighty, righteous king. 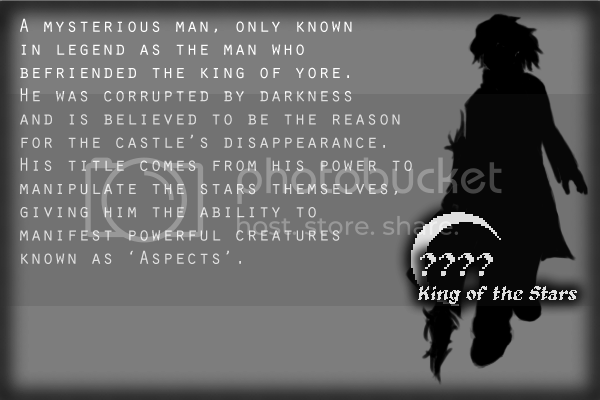 Though his name is now unknown, his deeds are what make his story legendary. With his will of steel, took the four warring lands and wrought them into one unified kingdom. With his magic, He brought happiness and plenty upon his people. And with his own hands he felled giants of evil and brought light to the darkest corners of every man's heart. Death was the one adversary he had not the desire to overcome. When the Great King died, it is said that the stars faded and the land cried in anguish. He left but a single heir. Barely into his second decade, the young king felt himself crack under the weight of his father's crown. The people demanded that he make the stars shine once again. His anguish, though great, was ignored by the land that once yielded to the Old King. It was in the young king's moment of greatest despair that a strange figure arrived at the gates of the castle, on the very cusp of death. Nursed to health at the King's behest, the young stranger proved to be an adept swordsman, and in time, a stalwart friend. Together the two faced insurmountable odds and prevailed. With his friend at his side, the young king steeled his heart, and won those of his nation. The stars shined once again. Something in the King's friend had changed. Where once there was light behind his eyes, now there was darkness. In the dark of the night, he would steal away into the forest and return with even less of his former self remaining. So the King followed his friend to where he would run. A foul darkness pervaded the forest; sickly and insidious. As he gazed toward his friend, his eyes caught sight of something so terrible. So horrific. That the castle was never the same again. "An ancient nomadic legend tells of a castle, surrounded by mist. Long ago, it was the center of a thriving kingdom, ruled justly by it's four regents with the power to move the earth and heavens themselves. Until one day, the castle disappeared into the mist, never to be seen again. 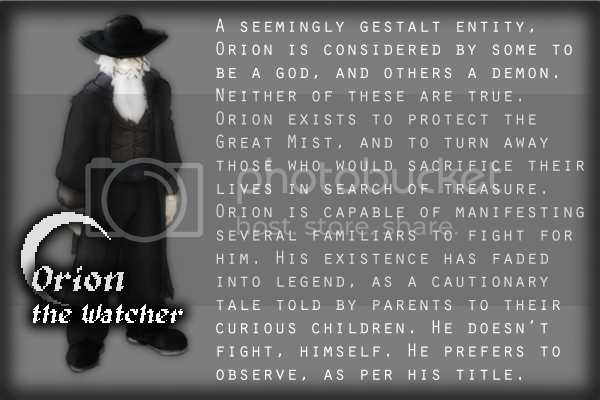 Some say the castle was afflicted by a curse so dark, that even I, Orion the watcher couldn't break it. Children are told that if they wander too far into the mist, the curse will take them, and they would disappear too. Not fazed by his childhood tales, young Aruchid takes flight into the beyond, filled with a deep sadness. Perhaps it is he who can break the cycle. I shall test his mettle, and weigh his soul on the scales of fate..."
Don't be daunted! Though this combat system has many features, it's actually quite straightforward. 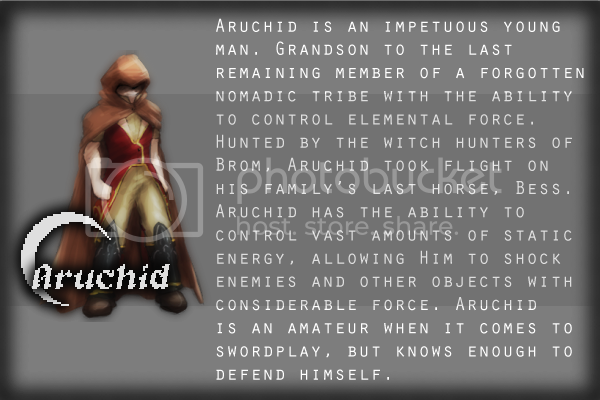 The main battle consists of three main phases, and a few optional phases. Attack, Shock, Defend. Sound familiar? It's basically Rock, Paper, Scissors. 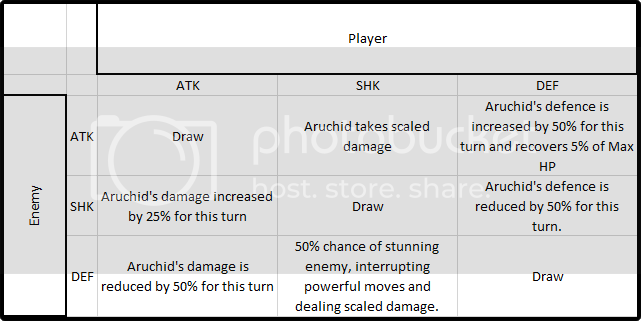 This occurs before each turn and determines whether Aruchid will take an Offensive stance, Defensive stance, or if he'll attempt to stun the enemy. I refer you to my glamorous table enveloped below. Each enemy, Minor and boss have a pattern that they follow. This means that the enemy will always choose ATK twice at the start of the battle, followed by SHK, then a random pick and finally DEF before looping back to the two ATKs. These are patterns that you'll have to work out yourself to assure the best chance of victory. Study enemies well, you don't know how long their patterns are, or if a move is random. That said, there are some items which reveal a portion of the enemy's pattern, should you have one and be in need of it. For bosses, keep a look out for clues in the area! Once you've chosen an ASD command and it's effect is put into effect, you move on to phase 2, Command Phase. This is the part we all know and love, the classic RPG style battle menu, consisting of four choices. Attack is pretty standard. Chop chop chop, watchin' monsters drop. Skills are learned via the Anima system, which I'll explain later. They can have many effects, not least allowing you to deal massive damage. Defend might seem obsolete when you've already won the DEF ASD. But reducing the enemy's damage by 75% in total and healing for 10% of your Max HP is nothing to sniff at. Items can have a plethora of different effects. They can addle the ASD in your favor, reveal an enemy's HP, reduce skill cooldowns and cast various powerful magicks. Cool huh? Let's look a little more into items quickly. There are 5 kinds of items. Classic. Healing items restore HP, Cure ailments and reduce skill coodowns (Like Ethers). It also includes the Litanies which apply Auto-res. Very handy for a 1-man battle. These beauties exist solely to screw with the ASD phase. Double the effects of victories, swap effects around or even skip the ASD altogether. Use wisely. These use an elemental magic at a random level. Incredibly useful in a pinch as they don't apply skill cooldowns. Where to begin? 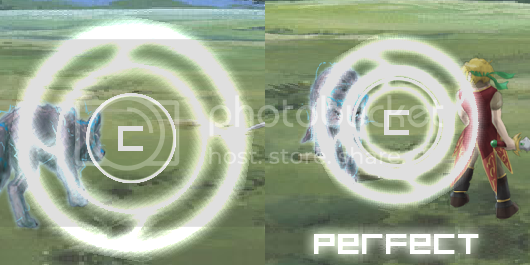 Reveal Enemy HP, View an enemy's next ASD, Double Fragments or sacrifice your fragments to fully heal after the battle. Again, use with care. You heard me mention cooldowns, right? Yeah that's a thing. Every item has a cooldown period, so you can't spam powerful items one after the other. The more potent the item, the longer before you can use another item. 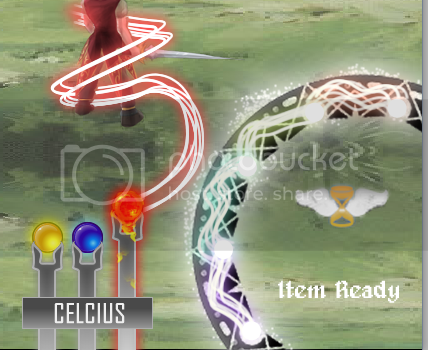 Skills also have a cooldown separate to the items. Skill cooldowns can be reduced with healing items, item cooldowns however, cannot. The Command Phase leads on to the damage phase, but what happens there is far too obvious to need to explain. OPTIONAL PHASE 1: SHOWDOWN, BABY! So, it'd be a hell of a shame if you got 5 ASD draws in a row and had nothing to show for it, right? You and your enemy stare each other down for a random amount of time. You take a breath and prepare. A timed button press occurs! If you successfully hit the timed button press, you can deal an immense amount of damage to your enemy, or just a scratch. Lose, however, and you may have to endure the shame and damage for an eternity. All is fair in SHOWDOWN! Another benefit to the ASD system is it's combo feature. Every time you successfully mash the enemy a minimum of 5 times in a row with the ASD system, either by dumb luck or careful planning, you earn yourself a combo. Not only do you feel good about the many flashy colours you've just unleashed upon the screen, you also get to give your enemy hell. As you progress in the story, you'll gain other combo skills with various effects, each flashier than the last. 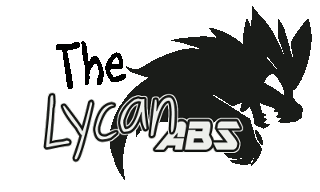 And that's all I have to say about the battle system for now folks! Thanks for reading! TL;DR: Pretty sick battle system. Needs work but could be good idk. In Rain in January, your victories are rewarded with dark fragments. 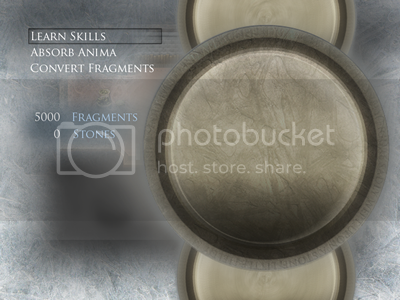 These fragments can be used in the Anima Converter. There are three options as you can see above. Convert Fragments - Turn fragments into Anima Stones. Of course, this is my favorite part really. All of Rain in January's music is and will be composed by yours truly. I've prepared a few samples for you today, but I wont tell you what they're for or when they're played. Hopefully those give you an idea of some of the feelings I'm trying to squeeze into the game. So here's where I get to be totes humble. Skill Shop by the one and only LegacyX, edited by me. And the battle system is just a botchy edit of the default battle system done by me. Currently the battlebacks are just a placeholder. Most of the graphics are placeholders and just waiting for me to find something I'm happy to settle with. The soundtrack is all original by myself. The game itself belongs to Valence Studios. Zackwell, it's pretty cool to see you're still around! 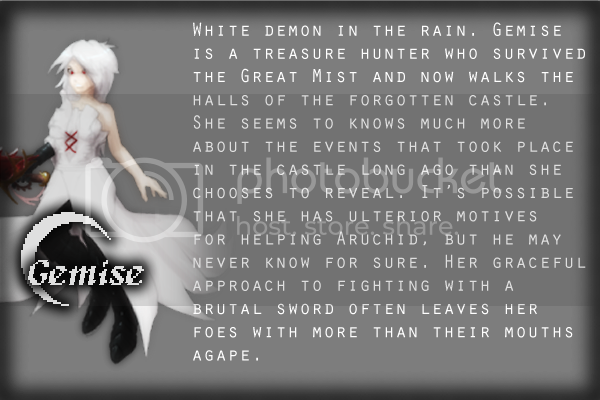 The backstory, characters and overall concept sounds interesting. The music is well done as always. Are you using actual 3D for the characters or are they just 2D per-fabrications based on 3D models? Ooh, nope. The characters are all hand drawn by Leongon, a good friend of mine. Each enemy/character has a front and back pose which switch depending on the camera angle. (06-06-2016, 04:45 AM)Zackwell Wrote: Ooh, nope. The characters are all hand drawn by Leongon, a good friend of mine. Each enemy/character has a front and back pose which switch depending on the camera angle. did you make the battle system from scratch or did you use the goldensun battle system? although I must admit that this looks gourgeous! It's the Golden Sun system. The coder's original name is RotimKid just as Zack posted. But he changed it to Shockwave a couple years ago. Same guy. NICE!!! this HUD looks really epic! I must say that once the battle sprites are working on Lunarberry and my side then we'll be starting on a customized HUD as well! i wish you the best for your game! because I want to play it! UPDATE: New Music track, "The Castle Gardens" available for listening. Siletrea Wrote: commercial or free? The game itself will be free, I hope. If I get more people involved in the creation it'll probably gain a little pricetag, but nothing ridiculous. But I'll be setting up a paypal for if anyone wants to donate some to help towards the cost of the graphical assets. Just examples of the sprites I'm making myself. Trying to ween myself back into working on this. I also made a font from my handwriting which I tried so hard to make both stylish and legible.